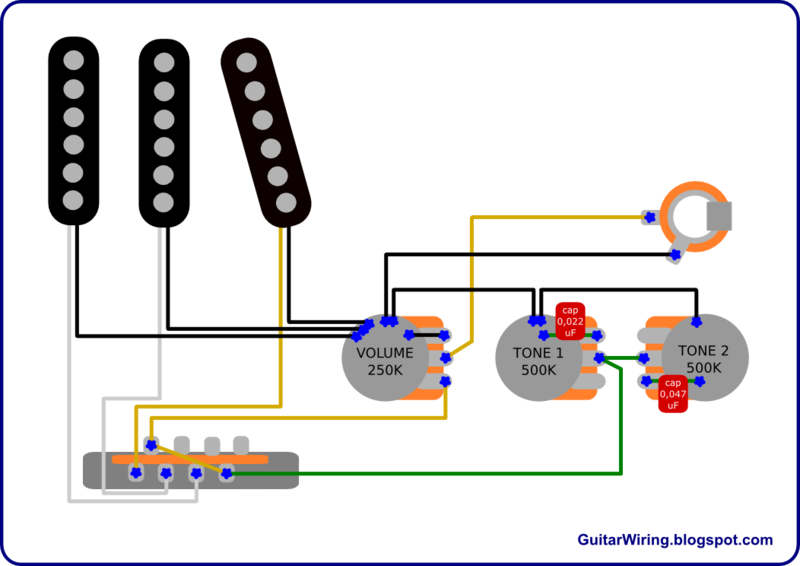 This is a simple Stratocaster and Fat Strat wiring modification that changes the tone control capabilities. With this mod you will have much wider palette of tones to choose from by using the tone knobs. All modification process is based on changing the tone caps, the tone pots and their connections. There are two capacitors: 0,022uF and 0,047uF. They are always connected with the main signal line of the guitar wiring, no matter what's the pickup selector position. The tone filters are controlled with 500K pots. 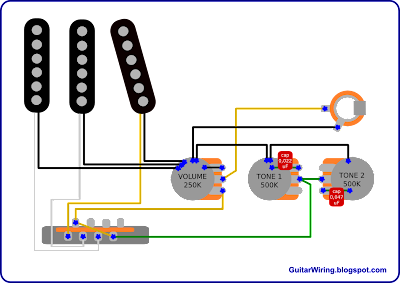 A common Fender Stratocaster wiring has 250s here. With this mod, we need a higher value, because three 250K pots connected together in the same time would make the guitar tone quite warm and maybe a little bit too muddy. With 500K it will be brighter - but if you will need some warmer sounds, you've got two different tone control knobs to use, right? The 0,022 is right for the „woman tone” (big turn), or some subtle smoothness (small turn). This value is used in some modern Strats. The 0,047 is more drastic. It will show a little bit more bass. It's a standard cap value for many classic Fender guitars. When you will use both knobs together, the caps will be summed up. It means, that with both knobs on maximum filtering (warmth), you will get a tone like with one 0,069uF cap. It's a very smooth sound, with a lot of bass and no treble. Usually it's better to choose only one tone pot to make the tone warmer. For example, for some fat rock tone you will use only the first knob, but for some jazz chords the second one will be better.